VCU – Video Control Unit 12.1"
LCD/TFT Monitor – Rolling Stock 12.1"
EMTrust GmbH is an Embedded Computing Expert specialized on CompactPCI, PCI and PCI Express based System Level Solutions built for demanding applications in industrial heavy duty environments. Several decades of design and market experience secure the availability of standard and custom system configurations for data processing, control, automation and mobile server solutions. EMTrust was founded in 2008 to specifically take over of major asset parts of the former Inova® Computers GmbH. E.E.P.D. GmbH is an Embedded Computing Expert specialized on COM Express, PC/104, SBC, Semicustom and Fullcustom Board Level Solutions supported by configuration control, LCC management and technology insertion services for OEMs. More than 70 employees make up the backbone of E.E.P.D., which was founded in 1988 and is currently a leading player for large volume supplies into strategic industrial OEM Key Accounts – and provides a wide range of services such as design, development, tests and production. V.D.S. Video Display Systems srl is an expert for special Rugged LCD Display Solutions in Trains, Autobuses and Maritime applications. Since its foundation in 1988 V.D.S. is supplying edge technology for superior electronic platforms in for demanding user environment. All V.D.S. products are screened for high performance and reliability on rugged platforms, design experience and particular care on product manufacturing. Merath metallsysteme GmbH is a mechanical enclosure expert for Industrial Electronics and Data Processing Systems. Standardized and customised product design are delivered with highly automated and KANBAN based CNC manufacturing facilities – at high quality, reliability and Just in Time. inaswiss Technology GmbH specializes in ruggedized solutions for industrial control, transportation, telecommunication, avionics and robotics. According to your specifications, we configure your systems and assist you intensively during the integration and later on with services. We represent established international manufactures with hardware standards such as MicroTCA, AMC, CompactPCI, VME, PMC, PCI, IP and others. LynuxWorks, a world leader in the embedded software market, is committed to providing open and reliable real-time operating systems (RTOS) and software tools to embedded developers. The company's LynxOS family of operating systems offers open standards with the highest level of safety and security features, enabling many mission-critical systems in defense, avionics and other industries. The latest product in the portfolio, the award-winning LynxSecure, offers a secure separation kernel and embedded hypervisor that forms a platform for the development of high-assurance systems. Since it was established in 1988, LynuxWorks has created technology that has been successfully deployed in thousands of designs and millions of products made by leading communications, avionics, aerospace/defense, and consumer electronics companies. LynuxWorks' headquarters are located in San José, California. The sales office for Central Europe is located in Haar (Munich). For more information, please visit www.tvlmedia.de or www.lynuxworks.com. for rugged and heavy duty user environments. 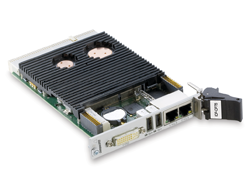 New: ICP-CP75 CPU provides scalable Celeron or Core 2 Duo performance. Based on Intel® Core™ 2 Duo technology with the Mobile Intel® GS45 Express chipset, EMTrust’s new ICP-CP75 3U CompactPCI CPU board provides scalable processing performance ranging from the 1.2GHz low-power Celeron® M to the 2.26GHz high-performance Intel® Core ™ 2 Duo.